A terrifying spectacular will unlock the haunted walls of Castle Rushen next month with help from the Isle of Man Steam Packet Company. 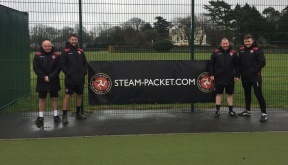 League Two football club Morecambe has teamed up with the Isle of Man Steam Packet Company to bring its soccer camp back to the Island. Budding photographers could see their work printed on the front cover of a popular brochure. A local dance troupe has performed at the Liverpool Echo Arena at one of the UK’s largest dance events. Three neglected ponies are to be rehomed in the island after a local animal-lover teamed up with the Isle of Man Steam Packet Company.